uPVC Windows & doors are a stylish solution for any modern home. uPVC products are built to last and can completely transform your property. Our suppliers provide the highest quality and they won’t rust, rot or peel through the hot summers and cold winters – all they need is an occasional wipe down with soapy water to keep them looking like new. Replacing tired looking windows and doors will instantly give a new look to your property. Our uPVC windows and doors will dramatically reduce heat loss actually and save you money on heating. Our uPVC windows and doors include multi point locking to make sure they are almost impossible to open from the outside when shut and locked. 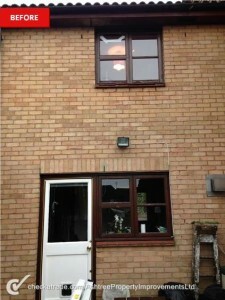 A property in Newmarket before uPVC products have been supplied & fitted. 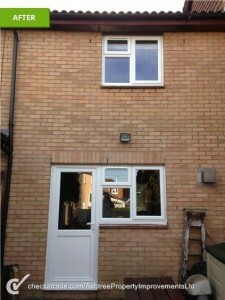 uPVC Double Glazing installed by Ashtree Property Improvements in Newmarket. Do you have questions about uPVC windows and doors?